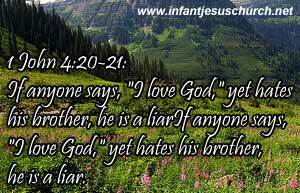 1 John 4:20-21: If anyone says,"I love God," yet hates his brother, he is a liar. For anyone who does not love his brother, whom he has seen, cannot love God, whom he has not seen. And he has given us this command: Whoever loves God must also love his brother. Be devoted to one another in brotherly love. Honor one another above yourselves. Love... the word can mean anything. Love each other with genuine affection, and take delight in honoring each other. Not realizing the key word for love, agape, is defined by action. Before Christians got a hold of agape, it was meant the same thing in our word today and does just about anything! The first reason taken from comparison, why we cannot hate our neighbour and love God, that is, because he that cannot love his brother whom he sees, how can he love God whom he cannot see? God demonstrates his love. He asks us to do the same for our brothers and sisters. Love must be more than talk; it must be genuinely demonstrated in action! God loves us because this last gives rise to the other: so he denies that the other kind of love with which I love God, can be separate from the love of our neighbour: of which it follows, that we say we love God, and yet do not regard our neighbours is lie shamelessly. Heavenly Father, I love you Lord, because you have so graciously shared your love with me. And that is your son Jesus Christ. We must confess, in our heart we intend to love others as you do, but our intentions often get washed away with "worldliness" or timidity. Loving Father, through your Spirit, prompt us to show our love to others in actions rather than just thought and talk. Through Infant Jesus, your greatest demonstration of love we pray. Amen. .
Let us pray for peace and harmony in the world, and let everyone love each other as brothers and sisters.